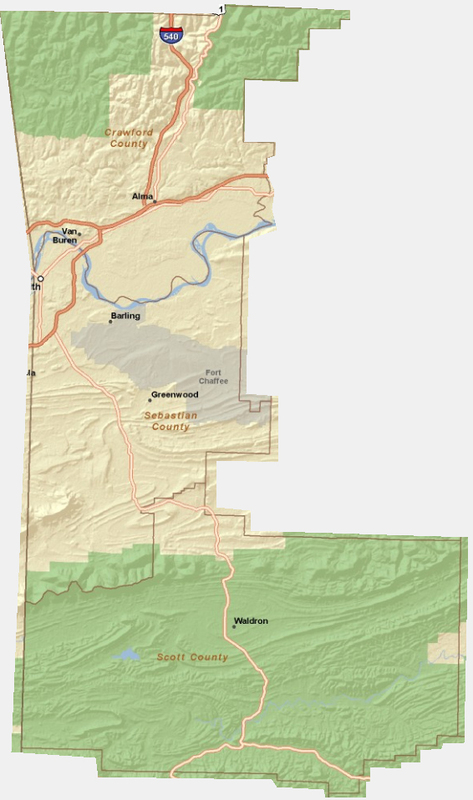 Emergency 911 services in the unincorporated areas (and most incorporated areas) of Crawford, Scott and Sebastian counties are handled by WAPDD. We make sure that 911 response is efficient and responsive to the needs of those seeking assistance. Together we can continue to ensure that residents of Crawford, Scott and Sebastian counties are safe and able to call on the help they need. Those with a new structure to be addressed can click here to start the process of new address assignment. If you are requesting an addresss in Crawford County or Sebastian County on a County Maintained Road, you must first obtain a "Driveway Permit" from the Road Department. A non-county maintained road must have 3 or more addressable structures on the road before it can be given a road name. Your 911 address number must be posted on your house/business unless it is not visible from the road, then it must be posted at your driveway. Arkansas will be the first state in the nation to implement a statewide supplemental 9-1-1 database. Supplemental databases provide citizens with the ability to enter information online that is immediately displayed to 911 call takers and dispatchers when a call is made from a registered phone. These services are free to citizens. To submit your information to the statewide database go to www.smart911.com. The additional information that you provide has proven to be lifesaving in areas around the country where Smart911 has been deployed.